"My purpose in writing this book is to lay hold of God's heart in every chapter, offering hope no matter how deep the pit. Corrie Ten Boom, a beautiful believer who endured the savagery of a Nazi concentration camp, put it this way: 'There is no pit so deep that God's love is not deeper still'." 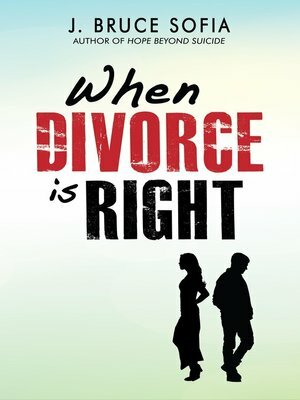 So writes Dr. Bruce Sofia in his newest book, When Divorce is Right, as he shares God's heart on this heartbreaking, and often misunderstood, controversial topic. Scriptures, Dr. Sofia opens wide the very vulnerable heart of God, and leaves no doubt as to when divorce is right.